1. Uber Driver- partner​ – Being an Uber driver-partner allows you to drive anytime. It’s flexible and you can drive around your schedule. Plus, you get to see the name and photo of riders you pick up. 2. Uber Eats​ – Try delivering with Uber Eats. You’ll bring the local food people love right to their door. You can deliver day or night. Just turn on the app, and you can start receiving delivery requests in your area. BEST PART — ​With Uber Eats, you can choose your wheels! Depending on your city, you may be able to deliver food with your car, bike or scooter! I was so, so excited when I learned about Uber Eats mainly because this sounds like a great way to earn some extra cash and because I would love to have some of my favorite foods from around town brought straight to my door! So first of all, how do you even get started with Uber? ● Be at least 21 years old — but depending on your vehicle and location Uber Eats Delivery Partner lets you deliver at just 19 years old! If you meet these requirements and are looking to earn money for your vacation on your own time, sign up HERE to see if you can become an Uber driver-partner. After you have consented to a standard and background check, and become activated to start driving, you can hit the road and start picking up riders! Halloween. Not only was my driver smart in choosing to drive on such a busy night, but my friends and I were also able to get home safely which is so important. Another tip is to pay attention to when there are major events taking place in your area and take full advantage of the opportunity to help others out and earn yourself some extra cash. In Minnesota, every Uber driver-partner I know was jumping at the chance to help out all the new tourists that had flocked here for the Super Bowl. Be smart about knowing when more people are going to be out and about. Personally I have always loved working at gigs where tipping is a possibility. Making sure someone has a pleasant ride may lead to a tip! There are so many things you can do to help make sure your riders enjoy themselves. You can go above and beyond by letting them choose the radio station or offering something complimentary. People love free stuff! I know my first ride with the Uber app matched me with a driver who had Starbursts in a compartment in the back seat for us. Talk about scoring bonus points! Even just taking the time to be kind, courteous and friendly can go a long way! Personally, I know when I’m trying to save money, I get stressed about spending on myself. I want to make sure I save enough for vacation, but a girl’s gotta live a little too. If you’re someone who likes a morning coffee or tries to get out with your spouse each week, these extra perks can add up like crazy. But I’m a firm believer that if you get too strict with something, more often than not, it’s going to backfire. Getting a side hustle, like driving with Uber is a great way to help cover expenses outside of your budget. 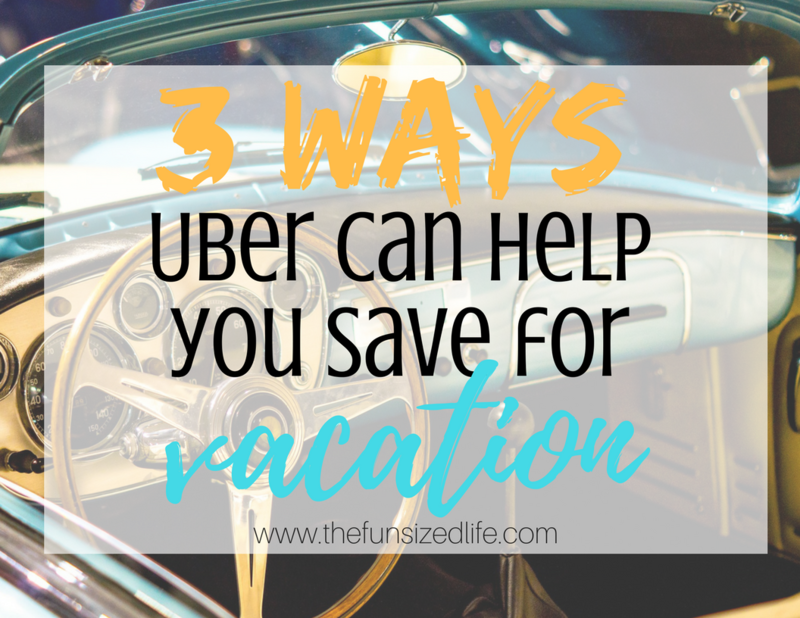 If you are already setting aside money from your paychecks to try and make it to that dream vacation, Uber is a great way to help you still get those extra perks in your life. You could also really buckle down and save fast by putting any money you earn toward your vacation to save twice as fast! One of the many perks of driving with Uber is that there are often rewards available to driver-partners. For example, Uber’s debit card can help you save money on gas – a plus if you are driving frequently. Uber often has partnerships with companies like AT&T, Sprint and Verizon to help driver-partners get discounts on their monthly phone plans. The money you save on gas and your smartphone bill can be put towards your vacation fund. With savings like these, it’s no wonder that many are choosing to drive with Uber. There you have it! Three easy ways to earn and save money for your well-deserved trip by driving with Uber! Personally, I had no idea there were so many potential options and perks that went along with becoming an Uber driver-partner. If you are interested in being an Uber driver-partner, you can sign up here. If delivering food is more up your alley, you can start delivering with Uber Eats by clicking here.